Neuhoff veteran earns top position in award winning cluster. 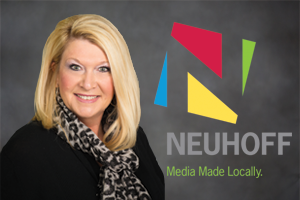 Kathy Byerly has been named Vice President/ General Manager of the Neuhoff Media-Decatur cluster. Byerly has been serving as the Associate General Manager/DOS of the five station and digital group which has earned multiple awards including its third NAB Crystal in the past year. Byerly continues a rise in the industry that started with a temporary front desk position at the Neuhoff Springfield stations, rising to local seller, local sales manager, then a jump to Decatur as AGM/DOS and now GM. Byerly has been working with Neuhoff COO, Mike Hulvey, in managing the market in the past. This marks the third time a Neuhoff sales leader has taken the key market leadership role for Neuhoff. Byerly joins Danielle Outlaw, GM of Neuhoff Bloomington and Michelle Campbell, GM of Neuhoff Danville, in following the path to market General Manager. Byerly has participated in the “Rising Through the Ranks” and Mildred Carter Group Mentoring programs from the MIW’s among others. Byerly has two accomplished adult children and lives in Decatur, Illinois. Neuhoff Media-Decatur includes NAB Crystal and Marconi Award winning WSOY-AM, WDZ-AM, WCZQ-FM, WDZQ-FM, WSOY-FM and a digital services business that includes NowDecatur.com.